Getting a Wi-Fi thermostat is a smart way to manage the temperature of your home from your phone. Smart thermostats also provide a huge convenience: many models allow you to create a heating and cooling schedule. Others can actually learn your preferences, like whether you sleep hot and prefer your home at a cool 68 degrees Fahrenheit at night. Smart home thermostats also help save you money on heating and cooling costs. 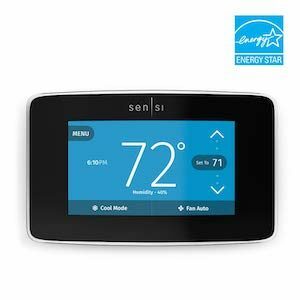 If you’re looking for a smart thermostat to help keep your home cool in the summer and warm in the winter, here are the thermostat models we like the best. *Standard retail prices as of 4/1/2019. Prices and availability are subject to change and may vary by retailer. Dimensions: 3.3 x 1.2 x 3.3 in. The third-generation Nest Learning Thermostat takes a thoughtful approach to temperature control by learning your family’s habits from the adjustments you make in the first few days of use. Nest’s smart thermostat will also keep you posted when temperatures in your home reach dangerous levels—for example, if your home gets cold enough that you’re at risk for burst pipes. You may see some significant energy savings with Nest. The Learning Thermostat saves energy by using a sensor and your phone’s location to detect when nobody’s home and setting itself to an “Eco Temperature”—40°F to 70°F for its heating mode, and 76°F to 90°F for its cooling mode. Plus, an independent study saw users save an average of 10% to 12% on heating bills and 15% on cooling costs. With Nest’s Farsight feature, your Nest thermostat uses a motion sensor to light up when you’re nearby. It also displays the temperature, weather, and time. Nest also offers remote temperature sensors, sold separately. These sensors work with the main thermostat and let you keep track of and control the temperature in specific rooms. If your living room houses your prized plant collection and you want to make sure it doesn’t get too cold, you can use a temperature sensor to make sure it stays at a balmy 75 degrees. Still, Nest products tend to be on the expensive side, especially when you start adding temperature sensors. If you’re not willing to shell out as much cash, we recommend the Nest Thermostat E. At only $169, it has most of the same features as the more expensive model, but it’s compatible with fewer existing systems and doesn’t have the Farsight feature. It’s also made of plastic, but it still manages to maintain the modern Nest aesthetic. ASecureLife’s recommendation: The Nest Learning Thermostat is a great all-around smart thermostat with good looks and thoughtful features. It would make a great fit for any home. >>Get the Nest Learning Thermostat. Dimensions: 4.3 x 1.7 x 3.4 in. 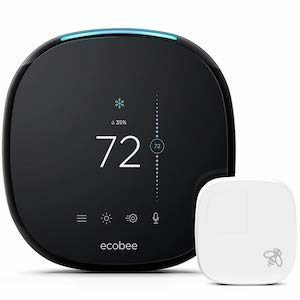 The Ecobee4 is a versatile and reliable Wi-Fi thermostat with a lot of smart home integrations. It offers flexible heating and cooling scheduling and an intuitive mobile app that helps you keep an eye on your energy usage. Like the Nest Learning Thermostat, the Ecobee4 “learns” your habits. But its method is a bit different from Nest’s: the Ecobee4 uses motion sensors to determine whether your house is occupied and adjusts the temperature accordingly. It also uses Wi-Fi to detect the local weather and determine the most energy-efficient way to keep your home at the temperature you like. Ecobee’s latest smart thermostat also comes with a remote temperature sensor. (You can purchase additional sensors in sets of two for $79.) These sensors both manage rooms that tend to be hotter or cooler than the rest of your house and detect occupancy to save you energy. You can save money too—up to 23% in heating and cooling costs each year. The Ecobee4 works with many smart home partners, including Apple HomeKit, Samsung SmartThings, and IFTTT. It also has a built-in Alexa speaker and far-field voice recognition, so you can tell Ecobee to drop the temperature a few degrees without crossing the room. The speaker itself has limited functionality—you can use it to control other smart products in your home and play music (as long as it’s not from a third-party app like Spotify)—but it’s not a replacement for your Echo or another smart home hub. ASecureLife’s recommendation: Ecobee4 is an intuitive smart thermostat with versatile functionality. If your priority is an integrated smart home, the Ecobee4 is a natural fit. >>Get the Ecobee4 Smart Thermostat. Dimensions: 3.7 x 1.0 x 4.9 in. 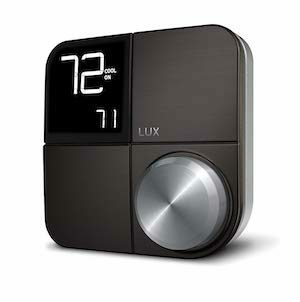 Honeywell has several different thermostat models to choose from, but this one is our top pick. 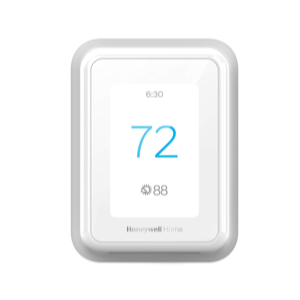 The Honeywell Home T9 is a touchscreen thermostat that looks a bit less contemporary than the competition but still has modern functionality. The T9 is easy to install, comes at a budget-friendly price, and works with Amazon Alexa and Google Home, so you can keep all the devices in your smart home connected. Currently, the Honeywell Home T9 isn’t compatible with Apple HomeKit, but Honeywell anticipates full compatibility in the near future. The Honeywell Home T9 gives you a ton of flexibility, especially when it comes to setting and forgetting the temperature of your home. You can create a custom heating and cooling schedule (via the Honeywell Home app or the thermostat itself) or opt for location-based temperature control, thanks to Honeywell’s geofencing technology. A geofence is a virtual geographic perimeter. With geofencing, smart products trigger a response (like dialing the temperature down) when a connected device enters or leaves a particular area—like when you drive away from your house. By keeping track of your phone—and therefore your comings and goings—the T9 controls the temperature in your home based on your location. This is a cool feature because it gives the T9 the ability to anticipate when you’re coming home and adjust accordingly. Some users say the geofencing feature is glitchy. That’s likely because geofencing relies on several factors, including your location and your mobile carrier. If you have certain rooms that tend to run warmer or cooler, you’ll have to purchase Honeywell’s smart sensors separately. These sensors can make sure the temperature is exactly where you want it to be in any given room, with a signal that reaches up to 200 feet (that’s about 10 standard-sized American cars in bumper-to-bumper traffic). You can purchase one sensor bundled with the thermostat for $199 or additional sensors in sets of two for $80. ASecureLife’s recommendation: The Honeywell Home T9 offers great functionality with some basic perks. It’s pretty new though, so we recommend waiting out the growing pains of its app before purchasing it for your home. >>Buy the Honeywell Home T9. The Lux Kono Wi-Fi Thermostat has basic functionality; works with Alexa, Google Assistant, and Siri Voice commands; and is pretty inexpensive at $149. But it has a dated look and lacks a touchscreen display. Users say it’s easier to control solely through the app or with voice commands than on the thermostat itself. The Emerson Sensi Touch is intuitive and works with Amazon Alexa and Google Assistant. But users report the customer service is lacking. And at $169, it’s the same price as the Nest Thermostat E, which offers greater functionality and a stronger reputation. For most homes, the Nest Learning Thermostat will work wonders. We like that it’s user-friendly, looks great, and offers significant energy savings. Plus, if the Farsight feature isn’t important to you, the Nest Thermostat E offers a lot of the same functionality for a lower price. Either way, both take a thoughtful approach to keeping your home cozy and comfortable, making them some of the best thermostats available. >> Get the best smart thermostat on the market. 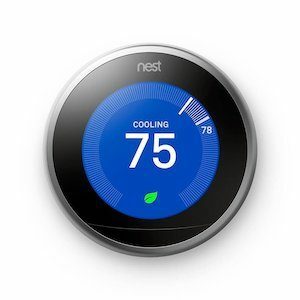 Buy the Nest Learning Thermostat on Amazon.